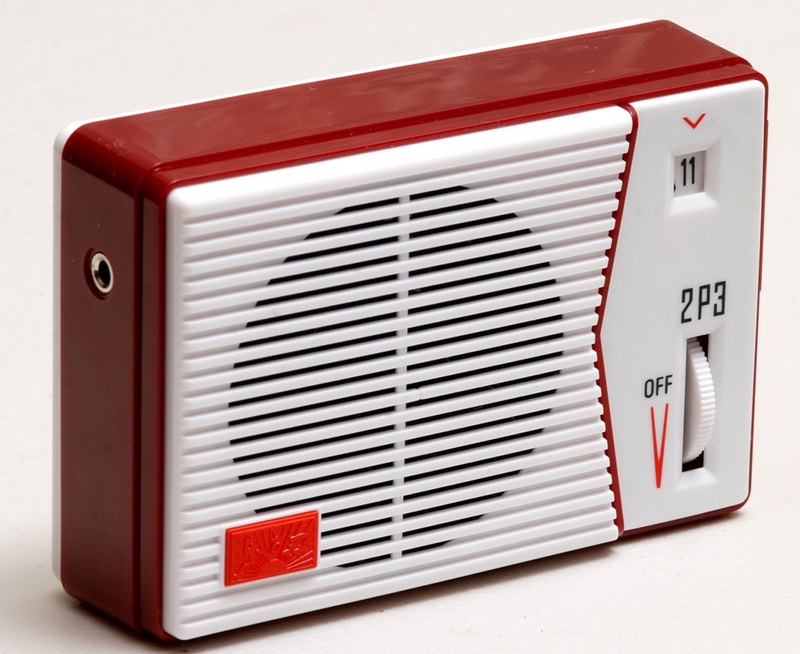 The result of building the Tecsun 2p3 is a nice looking portable AM transistor radio. If you made any soldering mistakes during the construction of the kit, they’re not going to be visible once things are inside the case. I’m going to compare this radio to the Sony ICF-S10MK2 AM/FM radio, a fairly common AM/FM radio which I have owned for several years, and which is roughly comparable in size. As photographed above, both radios have their ferrite bar antennas inside the case, positioned horizontally for best reception. 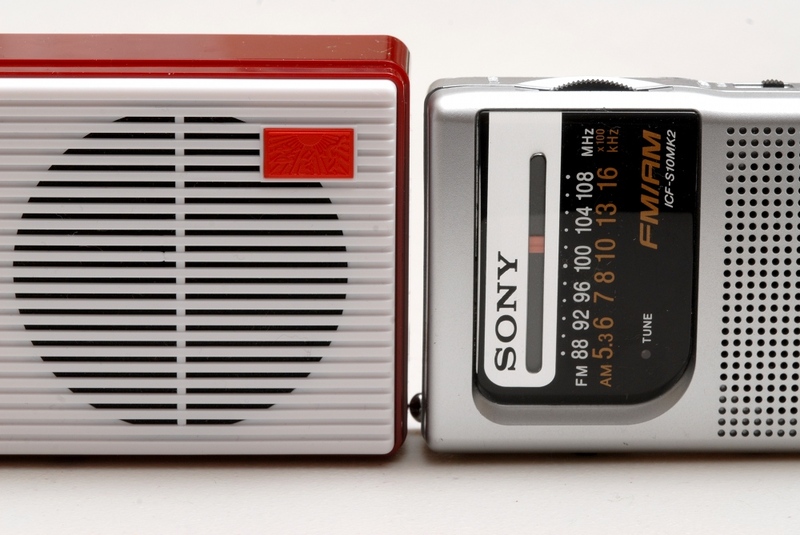 The Sony is intended for use in “portrait” orientation (long dimension vertical), while the Tecsun is intended for use in “landscape” orientation. 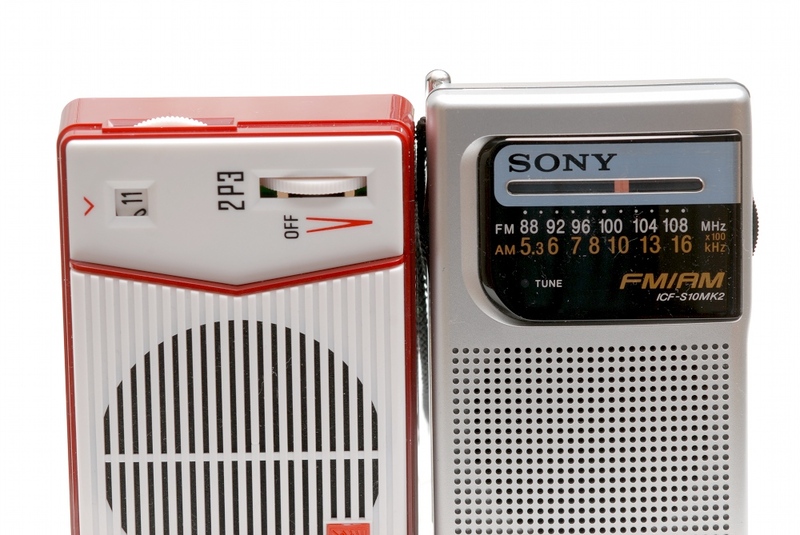 The Sony is AM/FM, while the Tecsun is AM only. The Sony has a wrist strap, while the Tecsun has none and has no place to attach one. The Sony has a telescoping whip antenna, but that is only useful for FM. The Sony has a dial scale, while the Tecsun has little numbers that rotate on the tuning knob and are visible through the window. 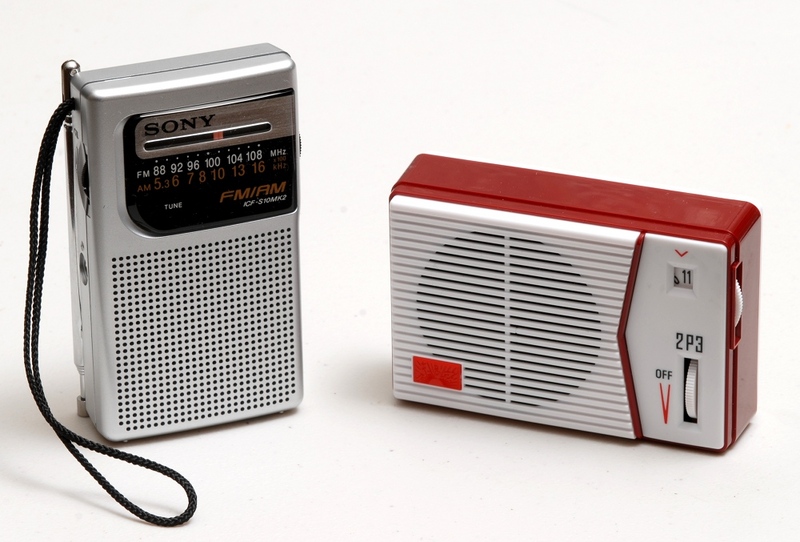 The Sony has a small door that slides off to replace the batteries, while the Tecsun requires a screwdriver to remove the entire back of the radio to replace the batteries. The screw that secures the Tecsun’s back is threaded into a metal standoff (no wimpy plastic threads) and is quite robust. The Sony is thinner in the two smaller dimensions, while it’s just a hair longer in its longest dimension. Overall, I’d say the Tecsun is a hair bigger, but I can’t imagine any practical circumstance where the size difference is enough to matter. How do they perform? Both are quite sensitive. The Sony has an edge in selectivity, but the Tecsun isn’t at all bad. From my home north of San Francisco, I could easily hear Los Angeles Station KNX, 375 miles away at 1070kHz, only 20 kHz away from local powerhouse KNBR at 1090kHz. The selectivity of the Tecsun was enough so that the powerful local station did not present any interference whatsoever to the more distant station in Los Angeles. When a weak station is just 10kHz away from a strong local station, neither radio is great, but the Sony is clearly better at separating the two. The Sony has a more aggressive AGC, meaning that both weak and strong stations are at more nearly the same volume, while the Tecsun requires more volume adjustment when going between weak and strong stations — strong stations sound very loud in the speaker. The Tecsun has a slightly bigger speaker, and may have a wee bit more bass response. Or not. In any case, these both sound like what you’d expect from a tiny handheld AM transistor radio. You don’t buy one of these for the audio fidelity. I like the way the Tecsun has its volume and tuning controls in very different locations and orientations. On the Sony, they are on opposite sides of the radio, but otherwise similar enough that I frequently mix them up, detuning a station when I meant to adjust the volume. I followed the Tecsun’s alignment instructions to line up the tuning dial at 1600 and 530, and then the intermediate frequencies lined up very well, too. The Sony’s dial is much more poorly aligned — over 100kHz off in the middle of the dial — but it’s old, and I have never adjusted it. Unless I was wanting to listen to an FM station, I can’t imagine many situations where I’d strongly prefer one of these radios over the other. Maybe the Sony has the edge for handheld use at a baseball stadium, with its upright positioning and the wrist strap, while the Tecsun might be just a little bit nicer for picnic tabletop use, since its horizontal layout seems a bit more stable. But we’re really splitting hairs here. Is the Tecsun a great radio? I’d have to say no. But it’s not a toy, and not a bad radio, either. It is fully capable of being used as a good pocketable AM radio for news, sports, talk, and whatever else you might find on the AM dial. Like most AM radios, it hears local stations during the day, and is capable of picking up stations half a continent away at night. I like to keep a few small battery operated AM radios stashed around various places for use during power outages. Living in earthquake country, I never know when I might have a need to know what’s going on. This radio serves that purpose well. As I said in my first post about this radio, the reason you should buy this radio is to enjoy the kit building experience. You’ll end up with a pretty nice radio, but if you only wanted the nice radio, you’d probably be better off buying a factory-built model. I’d say the Tecsun is easily worth the approximately $26.00 price tag, but only if you don’t charge an hourly rate for the time you spend assembling it. If you enjoy the kit building experience, this is one where the finished product can be very useful and presentable.